View of the cutting to allow the level of Lake Forsyth to drain into the sea. Picture taken from the baches at Birdlings Flat after three bulldozers had done their job. 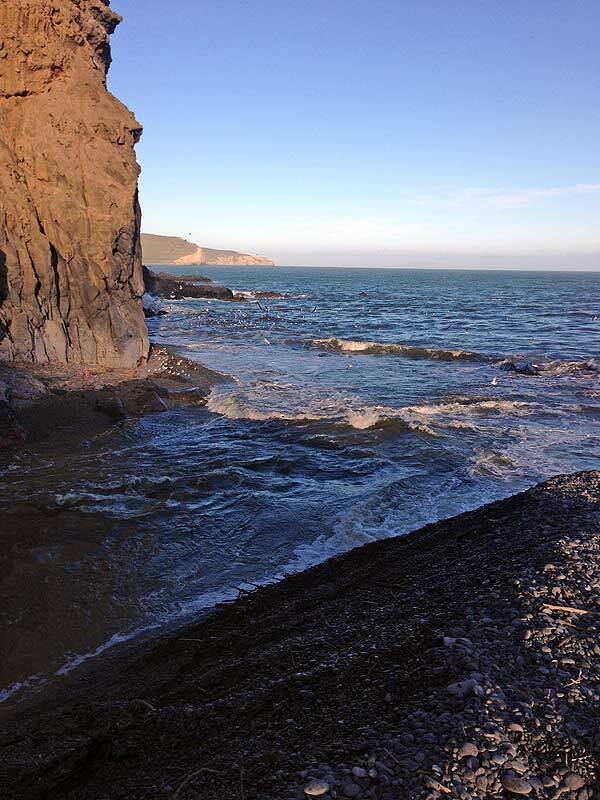 The cutting only remains open for a few days depending on sea conditions. During this time fresh searun trout enter the lake. Situated about an hour’s drive from central Christchurch, Lake Forsyth/ Wairewa has the advantage of being fishable when most other low land Canterbury waters are dirty following rain. I mean clear in a relative sense, for Lake Forsyth is always a bit discoloured as a result of run-off from neighbouring farmland. Lake Forsyth is only a few meters deep so the bottom is easily stirred up by a strong wind. Over the past decade, Lake Forsyth has suffered from potentially toxic blue-green algae blooms (planktonic cyanobacteria) prompting official warnings not to swim in or eat fish from the lake. At the very least fish should be gutted and cleaned well in fresh water and cooked through before eating. It is important not to allow your children to swim in Lake Forsyth. 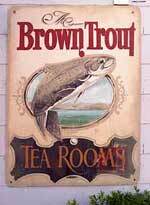 The sign outside the Brown Trout Tea Rooms at Little River. Canine pets are also very susceptible to poisoning from the toxic blue-green algae blooms. The Canterbury District Health Board issues warning about when the lake should be avoided and you can find these warnings on their website. These algal blooms mostly occur during the warmest months of the year. The area around Little River, at the head of the lake, was once rich in native timber. A sawmill at Little River cut timber that was hauled back to Christchurch by a railway built for the purpose. The rail line has long since gone – the last tram ran in the early fifties – but the bank along which it ran is still a feature along the northwestern shoreline. View of the cutting to allow the level of Lake Forsyth to drain into the sea. Picture taken from the baches at Birdlings Flat after three bulldozers had done their job. 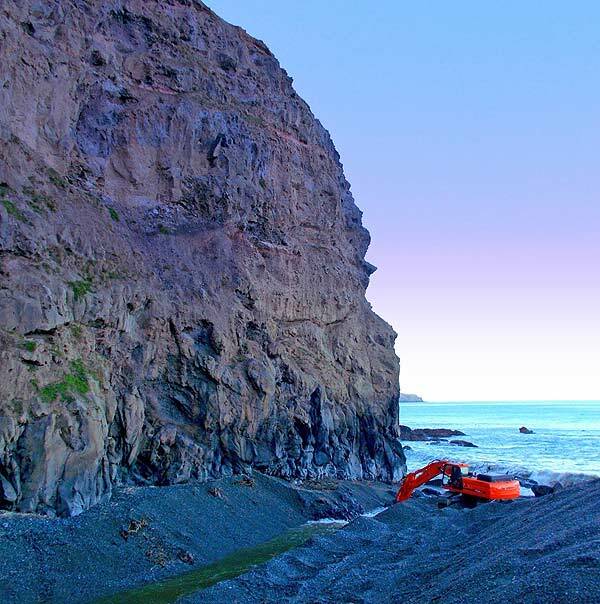 The cutting only remains open for a few days depending on sea conditions. During this time fresh sea-run trout enter the lake. Still water on Lake Forsyth. 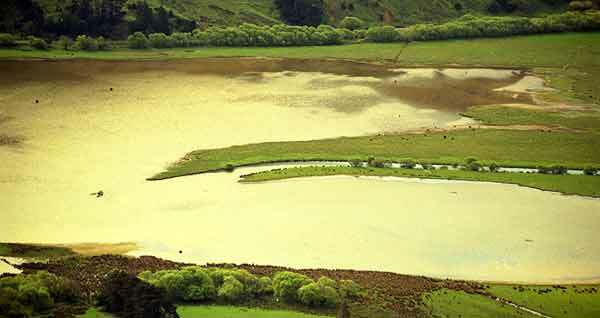 The Maori have long regarded Lake Forsyth as a valuable source of food. Eels are still caught by local Maori in channels dug in the stones at the south-west end of the lake near Birdlings Flat. As a trout fishery, Lake Forsyth can be surprisingly good at times. 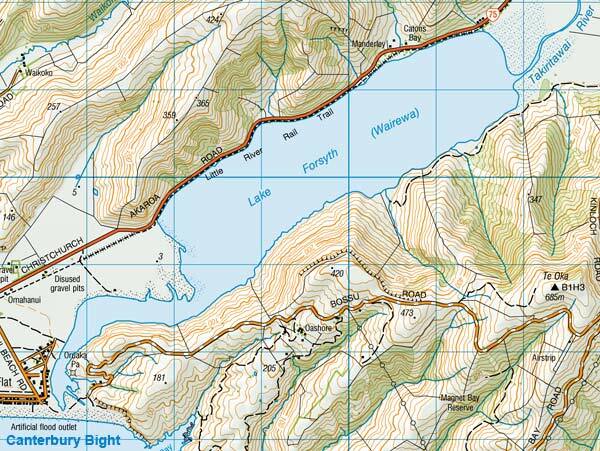 This is especially so if fresh sea-run brown trout have managed to enter the lake when it has been opened to the sea. Wading trout anglers appear like ducks on a pond as they fish the southern end of Lake Forsyth. In this view looking west from the hills on the southern side of the lake you can see Lake Forsyth in the foreground, Kaitorete Spit and Birdlings Flat (centre left), the sea to the left, and to the right Lake Ellesmere in the distance. The Takiritawai River (Little River) flows in at the head of Lake Forsyth. As the lake level rises it advances across the paddocks. Note the duck shooter’s maimais. Trout anglers dot the shallow southern end of Lake Forsyth in the late afternoon sun. Note the duck shooters’ maimai to the left of the picture. Fishing Lake Forsyth July 2015. Photograph courtesy of Tim Nicol. Digger cutting a channel through the shingle spit to the sea to release the water from Lake Forsyth. July 2015. Lake Forsyth Opening. July 2015. Photograph courtesy of Tim Nicol. The Takiritawai River (Little River) flows in at the head of Lake Forsyth. A few hundred metres upstream it is joined by the Okuiti and Okana Rivers. The lower reaches of these streams are sluggish but are favoured by some anglers. Lake Forsyth is almost 8 km long by around 1.5km wide. Its length can extend inland further following seasonal rain. 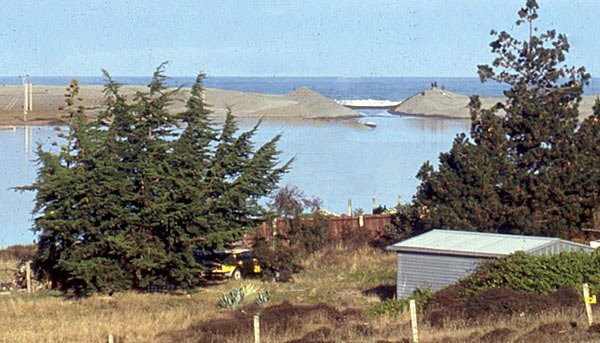 When the level of the lake becomes too high, a channel is cut by bulldozing a cutting through the shingle spit, opening the lake to the sea. The opening soon closes on the next tide though natural seepage continues to drain the lake to some degree. When the lake has been opened sea-run brown trout are known to ride the breakers and enter the lake. The best fishing spots seem to be either the mouth of the Takiritawai River or the shallows at the opposite end of the lake behind the rubbish tip. I have on occasion counted several dozen trout anglers fishing in a line where the lake narrows at the southern end. It is a somewhat strange site to see anglers standing in line out in the middle of the lake. The water is shallow so by the time they have wadded out to waist depth they are some distance from shore! I have also seen birds diving after silveries. Brown trout also herd the silveries toward the shallows. 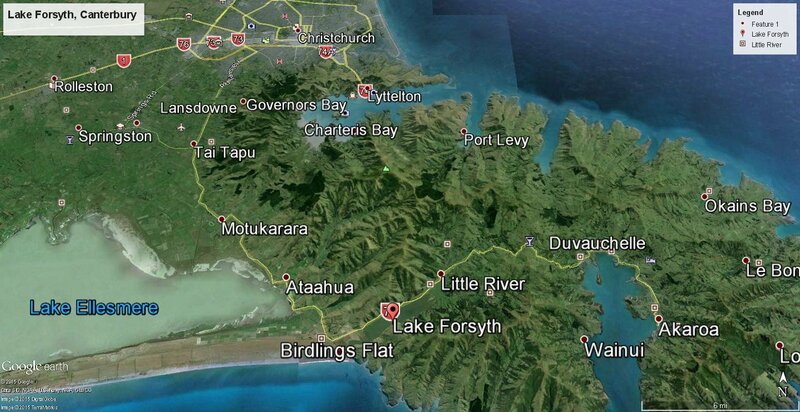 When the outlet (at the bottom of the map) is opened the lake drains into the Canterbury Bight. According to a newspaper report in the Christchurch Press dated 25 June 1977, back in 1830, it was possible for a whaleboat to enter Lake Forsyth from the sea. At that time the lake was known to whalers as Mowrey Harbour. The early whalers used it to transport timber from Little River Bush to their whaling stations around the south-western bays. Since those days huge rolling ocean waves have piled shingle high on the beach closing the outlet. Nowadays it is opened only by powerful bulldozers. Map sourced from LINZ. Crown Copyright Reserved. Each blue square on the map is 1 km across. Brown Trout Tea Rooms at Little River The preferred fishing method is a sunk feathered lure which can either be fished on a fly rod or spinning gear with the use of a small lead weight. Popular lures are Parsons Glory, Yellow Rabbits and Hopes Silvery. Change over to a darker lure such as a Black Rabbit or Black Phantom as the sun sets. Perch are also common in Lake Forsyth and will readily take a small Mepps Black Fury, Tillin’s Cobra, Black Toby, or Tassie Devil. 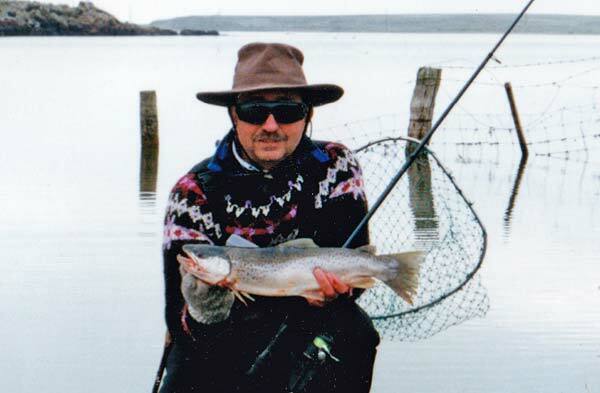 The best trout fishing takes place when Lake Forsyth has recently been opened to the sea and fresh sea-run brown trout and silveries have entered through the cutting. 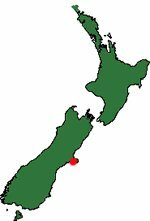 If this coincides with a period when the Rakaia River, and other Canterbury rivers, are in flood then there can be a sudden burst of angler activity on this otherwise forgotten lake. 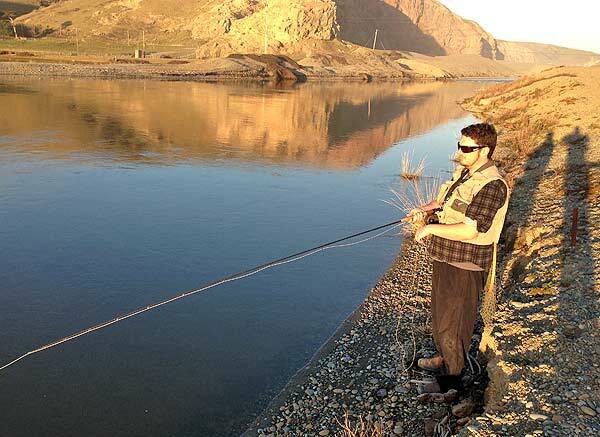 However, it is generally not recommended as a trout fishing destination due to its poor water quality. Sea-run brown trout from Lake Forsyth. 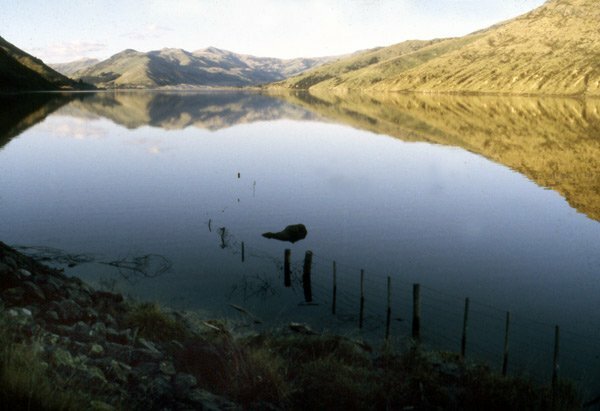 Lake Forsyth is located on the south side of Banks Peninsula about 50kms by road from Christchurch. Note the typical uninviting green colour of the water caused by potentially toxic blue-green algae blooms. Map: Google Maps, CNS/Astrium, DigitalGlobe, TerraMetrics. Click to enlarge.